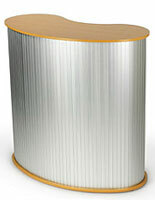 37.5" x 61.5" x 19.5"
Can your business benefit from trade show podiums for events? 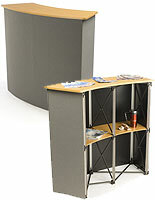 Available in a variety of styles, our lightweight and user friendly collapsible exhibit counters offer public speakers or presenters plenty of room. 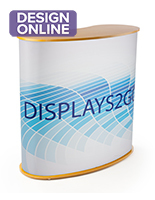 Portable trade show podiums are perfect bases for demonstrations, promotional literature displays, sample merchandise stations and of courses make great speakers' stands. 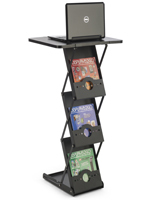 Collapsible display fixtures are convenient for presenters and event attendees alike in that they ensure that presentations have high visibility in even the most crowded areas. 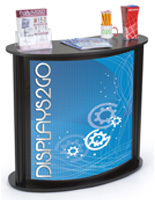 These commercial quality trade show podiums, or pop up portable counters, are perfect for in-store or off-site events because the design is simple to set up and take down. 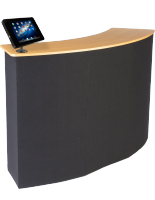 Sturdy countertops are available in many sizes, styles and configurations, so it is easy to find a model that will properly accommodate any display needs, including matching branding, graphics and decor colors. 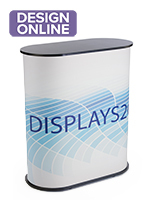 From custom printed trade show podiums with full color fabric base wraps to simple metal truss counters, these versatile promotional fixtures offer economical display solutions for any business. 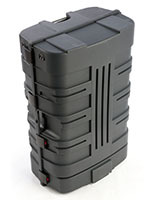 What features make portable event counters so perfect for off-site event use? 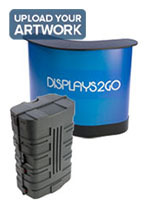 Trade show podiums for booth or exhibit display come in different shapes to accommodate varying uses. Traditional rectangular countertops are great for smaller spaces. 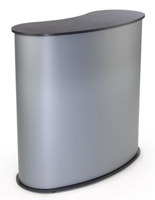 Wider and curved surfaces are better when there is enough room to spread out or where foot traffic needs 3-sided access. 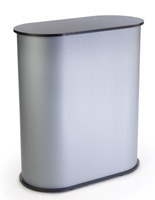 Bean shapes are some of the most popular because people are intrigued by the unique design. 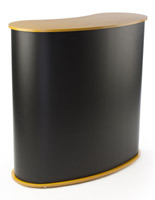 Our portable counters have durable construction and use materials like medium density fiberboard and Formica. 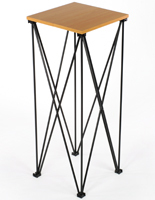 Many of the truss configurations feature a metal framework that is extremely sturdy. 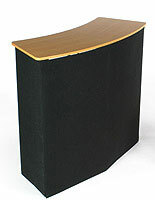 Corrugated plastic is used for the sides of the some of the podium bases, while fabric is used on others. 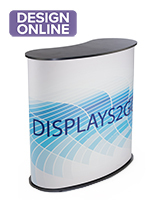 Collapsible counters with custom fabric covers are a favorite for high traffic public events because most are designed for use with hook-and-loop accessories, which makes it easy for users to attach signage, literature dispensers, and other helpful add-ons. 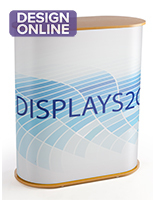 Custom-printed portable podiums and stands are also available that are ideal for drawing attention to branding and advertising or simply increasing name recognition. 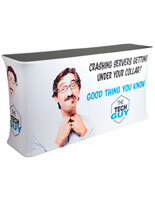 Full-color digital printing allows photographic-quality image reproduction that will make logos, graphics and ads gather customer attention in any location. 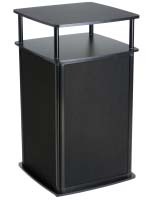 Many portable podiums come equipped with dispensing trays, pockets or display areas for advertisements, sales sheets or supplemental information. 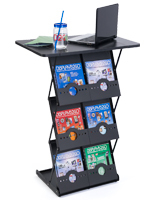 Almost all of our public presentation furniture is outfitted with hidden rear shelving, so that merchandise or extra literature like pamphlets, catalogs, and flyers can be stored there for quick replenishment. 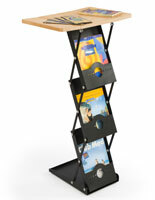 Although each of our portable furniture selections has unique features, there are some traits that are shared by all the designs. Quick and straightforward setup is probably the most important commonality. 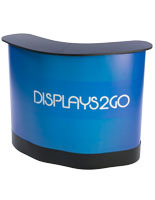 The counters are compact, lightweight, and typically include a carrying case to make transport to and from events much easier. 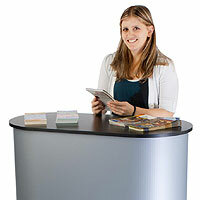 The innovative pop-up construction ensures that users can save valuable time when setting up at conventions or seminars. 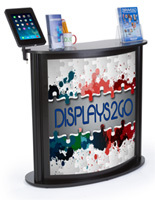 Assembling any one of these units takes mere minutes, so users can rest assured their booths and exhibits are set to go in time for the start of the event or meeting. 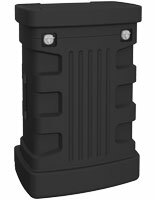 In addition to easy set up and take down, many of these portable event furniture pieces even include carrying cases for transportation and storage in between events.